Travel season is upon us, and what used to create excitement and anticipation now creates dread and anxiety. Flying is certainly not what it used to be, but thankfully, it’s also getting a little bit better, thanks to data science and advanced analytics. The world’s largest airlines generate and consume huge amounts of data on hundreds of millions of passengers, and that data is finally paying off for travelers. Of course, not all airlines use data the same way, and some of them hardly use it at all. 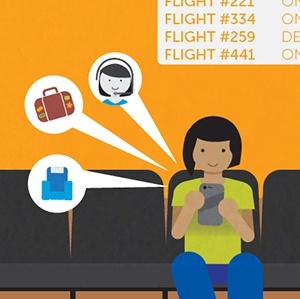 But here, we take an inside look at those that do to give you the three best ways advanced analytics are improving the travel experience for over 200 million passengers. Before you ever step foot inside the airport, you first must make your reservations. This includes flights and possibly hotel and car reservations, too. All three things have lists of attributes and amenities, and finding the right one can take quite a bit of time. But airlines are using analytics to analyze your purchases — and patterns in your purchases — to put the best choices for you at the top of your list. This type of analytics goes beyond simple preferences (though it includes them, too), and looks at far more detailed information and groups of information. And they’re not just looking at your choices, but everyone’s choices, to determine what behaviors go well together. Some might be obvious, like if you’re traveling with children, you’ll probably want a hotel with a pool. Others, less so, such as the pairing of geographic location and number of people per room. Business travelers typically get their own rooms and often need to be near a convention center, whereas people traveling in groups are often tourists and prefer to be near the center of town or tourist attractions. By finding patterns and correlations within the data, airlines can use a technique called K-nearest neighbor (KNN), which looks at customers with similar attributes and uses them to predict what preferences a given person will have. So if you’re a single man who uses Wi-Fi on planes, only stays at hotels with gyms, often flies to Omaha, and usually rents a coupe, then KNN will identify other customers with two or three of those traits and recommend the remaining amenities. If it turns out to be “wrong” (the customer rents a minivan), then that feedback goes back into the system so that it can learn and improve its recommendations for next time. The recommendations you see in your search results may not strike you as particularly personalized, but if you’re paying attention, you may notice that booking travel is becoming faster and easier. We go into even more detail on the science behind travel recommendations here. The flight value score, which we detail in a previous post, helps airlines determine which flights to cancel in order to create the least amount of disruption or dissatisfaction to passengers who don’t get to arrive at Point B at their designated time. This score is measured in minutes, where for each scheduled flight, the number of travelers, their connections, the times of their connections, and the number of minutes of total delay are all calculated into one score for each flight. So when a storm hits and an airline needs to reduce its takeoffs and landings by, say, 50%, it can quickly and easily choose the flights that will wreak the least amount of havoc on the fewest number of passengers. That doesn’t guarantee you’ll never have to spend the night in an airport, but it does reduce your chances. Cancelations that cause a lot of overnight delays will have much higher scores than those that don’t. The ramp and pax (baggage and passenger) score helps airlines assess passengers and their baggage to determine the risk of a flight’s delay based on who’s traveling and what they’re bringing. For example, a flight carrying a lot of children might be at a higher risk of delay than a flight with mostly adults because children can take longer than adults to get settled. On the other hand, if a flight has a large number of adults with a connecting flight to a ski destination and are traveling as a group with their skis and snowboards, then that flight may get a higher risk score, as those items will take longer to board. Also, studying the behavior trends of passengers from previous connecting flights may not seem immediately intuitive, but airlines have found that analyzing connections and their correlation with customer profiles can help predict potential flight delays. These are relatively flat examples, as no flight has all of one type of person, but advanced scoring technologies and machine-learning feedback loops help airlines determine what characteristics or behavior (or groupings of characteristics and behavior) cause delays. The higher the risk, the higher the score. Those scores are fed to disruption management staff, who can then prioritize the highest scoring flights for gate, ground staff, and crew assignments, and ultimately earlier boarding, with some extra cushion to allow for boarding delays. The engineering score helps airlines pre-empt the flights that could get delayed because of allocation of planes at risk for needing last-minute repairs. Every time an aircraft lands, it pushes out terabytes of data, containing critical insights into its “health.” Among that Herculean dataset, one of the interesting data points is something called an acceptable deferred defect (ADD), which can be used as an indicator to predict engineering delay risk. Once the ADDs hit a certain threshold, the risk associated with an aircraft to be deemed unfit is high. The hybrid analytics that go into generating the engineering score, which is done by looking at a variety of thresholds, are powered by a unique collaboration of humans (i.e. based on feedback from industry experts) and machines, or a concept we refer to as Man + Machine. The machine calculates the engineering scores and sends them to the operations team, who flags at-risk aircraft and schedules the engineers to look at the aircraft up to a day in advance. This reduces the chances of the aircraft being deemed unfit at the eleventh hour. As much as we hate disruptions to our travel plans, they happen. And often adding insult to injury is an airline that seems oblivious to the fact that it has ruined your trip by canceling your flight, losing your luggage, or having a lengthy delay. In cases like these, a little proactive communication goes a long way toward showing customers that airlines care about their passengers. On the flip side, airlines dislike formal complaints and are taking steps to improve communication in an effort to cool down potentially angry passengers. The result is almost a win-win (a true win-win would be not having the disruption in the first place or simply solving the problem, whether that means finding your lost luggage or getting you to your destination). The more sinister side of this, of course, is that they can’t reach out to all customers who’ve been disrupted, nor can they reach out to everyone at once, so they need analytics to sift through the thousands of current disruptions to help them decide whom to contact first. The calculation involves several factors, including your loyalty, your likelihood to complain, your likelihood to publish your complaint on social media or a blog, how much influence (or how many followers) you have, how badly your trip has been disrupted, how many negative experiences you’ve had with the airline in recent history, and/or any number of other factors. As a traveler, there’s no guarantee as to how to top their priority list (and who would want to? ), but with that phone call comes leverage. If you are called to be notified that your flight is delayed or canceled or that your luggage won’t be arriving when you do, know that you’re important enough to make the list, and seize the opportunity to ask for a quick rebooking, vouchers, replacement clothing or luggage, or anything else that will make your disruption easier. Know that if they’re calling you, it’s because they either value you a lot or they’re afraid of what you might do. Either way, you have the upper hand. Airlines are prime breeding grounds for Big Data and advanced analytics because they have known customers and a lot of competition. And whether you’re a frequent flier or an executive looking into how analytics can help your business, look to airlines for new use cases that drive the technology forward — and hopefully please a few passengers along the way. Want to learn how data analytics can help your organization achieve more personalized communication with your customers? Check out our newest white paper on personalization at scale.